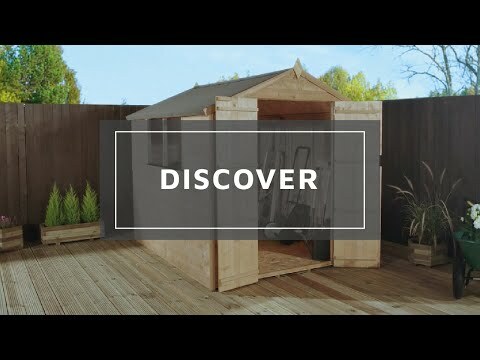 The 6’ x 4’ Waltons Overlap Apex Wooden Shed is the perfect solution for buyers who want a garden building on a budget.compromised. 28mm x 28mm interior framing forms the foundations of this shed, which is finished with overlapping pieces of manufactured timber. The traditional apex roof design provides extra headroom; it also increases protection against water ingress. The styrene glazed windows are a shatterproof alternative to traditional glass, making them safer as an added bonus. The single door has been ledged with framing on the inside for additional support, a butterfly catch is provided. Both the roof and floor are crafted from a durable and solid sheet material. To help prevent against rot from damp ground, this shed sits on bearers that raise the building from the ground below. Our Reply:Good afternoonThank you for leaving your feedback. It is good to know that you are pleased with your new garden shed. Thank you for your feedback. I am glad that you are happy with your order and hope you have many years of use of your purchase. Thank you for leaving feedback regarding your purchase. I am glad that you are happy with the building and hope that you may enjoy many years of use of it. Review:Nice size she'd just what I wanted but thought quality was a below what I expected for the price. Review:Shed is a shed is a shed! Its grand. Good quality and value for money. Review:Excellent service. Delivered on time and as instructed. They even climbed back over to lock the gate after themselves!! The shed was very easy to put together and the instructions were very clear but it would be better to have a few more than two people work on it. It's great that you are happy with the quality of your overlap shed and I thank you again for your feedback. Review:I work with a product heavily influenced by reviews so know how important this is. Have absolutely no complaints at all. Arrived when it should, perfect condition, reasonable price. Would 100% use again if we were to require anything else from their selection. I am thrilled to know that you are so pleased with both the service provided and with your overlap shed. I appreciate you taking the time to offer your much appreciated feedback and it is great that you would use Waltons again in the future. Review:The shed was ok, however, it was delivered unwrapped and damaged, which meant it has been elsewhere previously and therefore not so new. Customer services weren't that helpful either. Review:See previous screen for general view. Thank you for your great feedback regarding both the service and the shed purchased. I will pass along your feedback regarding the details and the planning of the door to the relevant teams for review. Customer feedback is valuable to us for these reasons. Review:I'm afraid I can't send a photo of the shed yet as we haven't erected it due to my husband's poor health at the moment. I am pleased that you are happy with the quality of your overlap shed and I thank you again for your positive review. It is great that you are pleased with your overlap shed and I thank you again for your positive feedback. Review:There are a couple of issues with the shed. Review:Good service,quick turnaround,value for money. I am pleased that you are happy with the quality of your overlap shed and found it to be good value for money. Thank you again for your great feedback! Review:Shed itself was good for the price, however the wood treatment on the door was very blotchy and missed in some places and also the componets wrapped in plastic were soaking wet. It was indicated that we would be notified of delivery but the shed was just dropped off without any forwarning. Review:Delivered and erected in same day, no problems. Our Reply:It is great that you are happy with your overlap shed and that no problems arose during delivery or installation, thank you again for your feedback. Review:Bought 2 of these to store bikes etc. Perfectly acceptable sheds at the cheap end of the market. Easy to assemble: the door hinge arrangements are a bit naff, but otherwise perfectly acceptable. Our Reply:Thank you very much for your feedback, I'm glad you are happy with your new buildings and if you need anything at all in the future please don't hesitate to call us on 0800 029 1000, thank you again. Review:Delighted with shed, home from home !!! Our Reply:I am so pleased that you are delighted with your overlap shed and we thank you again for your feedback.